Does this patient have minimal change disease and focal segmental glomerulosclerosis? Minimal change disease (MCD) and focal segmental glomerulosclerosis (FSGS) present with symptoms and signs of the nephrotic syndrome, characterized by edema, heavy proteinuria (greater than urine protein to creatinine ratio [UPCR] of 3), hypoalbuminemia, and hyperlipidemia. Patients may observe foamy or frothy urine. The onset of the nephrotic syndrome is typically abrupt in MCD and primary FSGS, whereas the progression of proteinuria in FSGS categorized as secondary to another condition (obesity, certain drugs, diabetes) may occur over years. Genetic/familial forms of FSGS may present in childhood or early adulthood and can present abruptly or in a more indolent fashion. Nephrotic-range proteinuria increases the risk for acute kidney injury, thrombosis, and infections, which may be present or develop after diagnosis. MCD is the most common cause of pediatric nephrotic syndrome but accounts for less than 15% of adult nephrotic syndrome. MCD may be idiopathic or develop in association with other pre-existing diseases or drugs. Common disease associations are hematologic malignancies and atopy, whereas rare disease associations are solid tumors, syphilis, tuberculosis, HIV, HCV, mycoplasma, erlichiosis, echinococcus, systemic lupus erythematosus, diabetes, graft-versus-host-disease, sclerosing cholangitis, sarcoidosis, Graves’ disease, thyroiditis, vasculitis, myasthenia gravis, Guillain-Barre syndrome, dermatitis herpetiformis, primary biliary cirrhosis, and antiphospholipid syndrome. Drug associations include non-steroidal anti-inflammatory drugs (NSAIDS), lithium, ampicillin, cephalosporins, rifampicin, penicillamine, bisphosphonates, mesalazine, salazopyrine, trimethadone, and interferons. FSGS accounts for up to 35% of nephrotic syndrome in adults but it may account for all steroid-resistant nephrotic syndrome in children. To date, most FSGS diagnoses are termed idiopathic as no known cause is identified. More rarely, familial/genetic FSGS is diagnosed in children and/or young adults, or FSGS is identified in association with other pre-existing diseases or drugs. FSGS that is associated with reflux nephropathy, hypertension, partial nephrectomy, severe preeclampsia, obesity, or other glomerular diseases is often termed secondary FSGS. Secondary FSGS and familial FSGS do not typically respond to steroids or other immunosuppressive medications. Drug associations include anabolic steroids, interferons, cocaine and heroin. A renal biopsy is required to diagnose MCD (Figure 1) and FSGS. Since MCD is the most common cause of pediatric nephrotic syndrome, children are often biopsied only after failing empiric treatment for MCD. 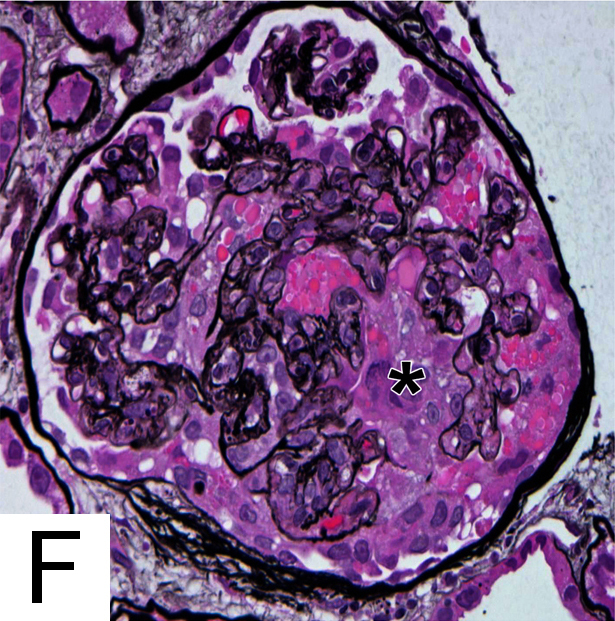 Renal pathologists may describe FSGS as one of following five morphologic variants: classic (Figure 2), hilar (Figure 3), tip (Figure 4), cellular (Figure 5), or collapsing (Figure 6). Typically, the collapsing and tip variants have more proteinuria at the time of biopsy than the other variants of FSGS. Electron micrograph showing extensive foot process effacement (arrowheads) in MCD. Spiral arrows point to microvillous transformation of podocytes. FSGS, classic variant showing obliterated capillary loops (*), hyaline deposition, and adhesion of tuft to Bowman’s capsule. FSGS, hilar variant showing segmental sclerosis at the vascular pole (*). 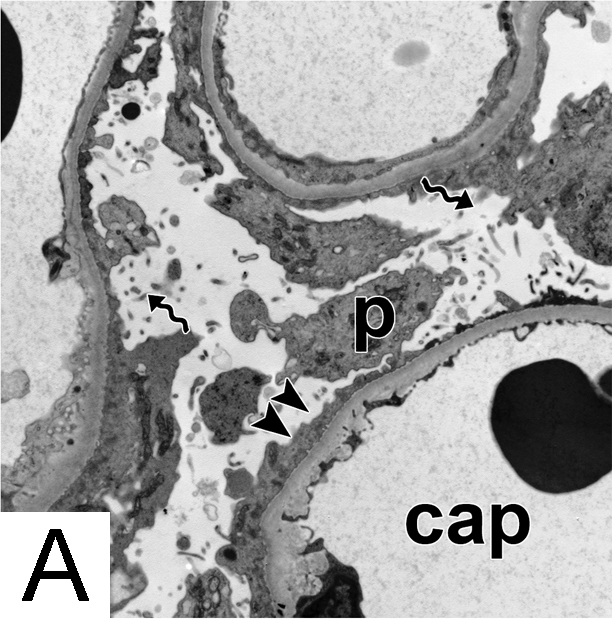 FSGS, cellular variant showing foam cells (arrowhead) infiltrating capillary loops of sclerotic segment and prominent overlying podocytes (spiral arrow). FSGS, collapsing variant showing collapse of capillary loops and proliferation of glomerular epithelial cells (*). Urinalysis; total protein in a 24 hour urine collection or total protein-to-creatinine ratio in a random spot urine sample; serum creatinine; serum albumin; and serum lipids. In conjunction with renal biopsy, additional screening laboratory testing helps to exclude other glomerular diseases causing proteinuria and include the following: serum and urine protein electrophoresis and immunofixation, serum free light chains, anti-nuclear antibodies, C3, C4, cryoglobulins, and viral serologies for HIV, hepatitis B virus (HBV), and hepatitis C virus (HCV). Once the diagnosis of MCD or FSGS is made by renal biopsy, the degree of proteinuria and the serum creatinine are followed at 2- to 4-week intervals to assess the response to treatment. Full remission is often defined as a reduction in proteinuria to less than 300 mg/day. Partial remission is often defined as a reduction in proteinuria by 50% and to less than 3.5 g/day. Relapse is often defined as a return in proteinuria to greater than 3.5 g/day. An increase in serum creatinine indicates worsening renal insufficiency and is more probable if complete or partial remission is not achieved with treatment. Urinalysis shows no active sediment, with the 24-hour urine protein greater than 3 g or spot urine total protein-to-creatinine ratio greater than 3 g/g indicating nephrotic-range proteinuria. Serum albumin may be less than 3 g/dL, and hyperlipidemia may be present. Additional laboratory tests may suggest the presence of other glomerular diseases; however, the renal pathologist determines on biopsy whether MCD, FSGS, or another glomerular disease is responsible for the patient’s proteinuria. Debate exists as to whether the morphologic variants of FSGS represent the same general glomerular disease. The differing response to treatment suggests that the variants of FSGS are not the same disease. New insights from studies focusing on a molecular definition of FSGS lend further support to the notion that FSGS is a descriptive term that captures a great number of distinct molecular defects leading to kidney podocyte injury and loss, and thus in the resulting progressive proteinuric disease. How should patients with minimal change disease and focal segmental glomerulosclerosis be managed? MCD is highly responsive to corticosteroids, which is first-line treatment. Almost all children respond within 2 months after initiating steroid treatment, whereas up to 95% of adults respond within 4 months. Failure to remit, relapse after remission, or intolerance to steroids may require second-line treatment (now most often with rituximab or tacrolimus / cyclosporine), but in many cases these children’s kidney biopsies ultimately reveal an FSGS pattern of injury. First-line treatment for biopsy proven FSGS not categorized as secondary consists of corticosteroids, with variable responses and lack of response or development of steroid-dependence during the course of therapy. Patients who fail to show evidence of remission within 4 months, or experience relapse after reduction of corticosteroid dose, or are intolerant of corticosteroids may require second-line treatment with tacrolimus / cyclosporine. Additional agents such as rituximab and abatacept are currently being evaluated for FSGS, but there are no conclusive RCT data to support their use at this time. Secondary FSGS typically does not respond to immunosuppressive medication and therefore the goal of treatment is focused on management of the cause of disease (weight reduction in obese patients, removal of causal drugs, or optimized management of diabetes etc). Management of the complications of nephrotic syndrome includes diuretics for the edema, angiotensive converting enzyme (ACE) inhibitors or angiotensin receptor blockers (ARB) for hypertension and for their anti-proteinuric effects, statins for hyperlipidemia, and therapy for thromboembolic events (aspirin or anti-coagulation therapy in certain cases). What happens to patients with minimal change disease and focal segmental glomerulosclerosis? The prognosis of MCD and FSGS is linked to the response to treatment. Patients who fail to achieve a durable remission or relapse after remission are at risk for the complications of nephrotic syndrome and progression to end-stage renal disease. The collapsing and cellular variants of FSGS carry a worse prognosis than other variants of FSGS. The diagnosis and treatment of MCD or FSGS is done under the consultation and care of a nephrologist. The tissue diagnosis of MCD or FSGS following renal biopsy is done by a renal pathologist. Primary care providers, physician assistants, and nurses assist nephrologists through laboratory screening and assessing patients for disease and treatment complications of MCD and FSGS. The 2012 KDIGO Clinical Practice Guideline for Glomerulonephritis provides recommendations for the treatment of MCD and FSGS.